Product code: ES8176 Categories: Art Deco, Art Deco Bracelet. This Art Deco emerald and diamond bracelet dating from the 1920’s is just exquisite and is the epitome of the style and quality that exemplifies this fabulous era. Just looking at the design alone will take your breath away, and the bracelet was beautifully hand made entirely in platinum and measures 17.2cm in length. And then there are of course the diamonds which adds an immense amount of sparkle. In total there are 272 diamonds that totals an astonishing 8.02 carats. The diamonds will make this bracelet get the attention that it deserves from near or far. However it is not just the amount of diamonds set into a simple line, rather it is also the incredible time and thought that went into make this bracelet that makes it so wonderful. And then there are the three natural emeralds set into the bracelet which adds an elegant amount of colour and extra charm and character to an already spectacular bracelet. The emeralds total 0.62 carats and are all perfectly matched in a fine green colour and beautiful clarity. The sections that are set with emeralds measures 14mm in width and no matter where or when this is worn, there is no doubt whatsoever that it will always be loved and admired. 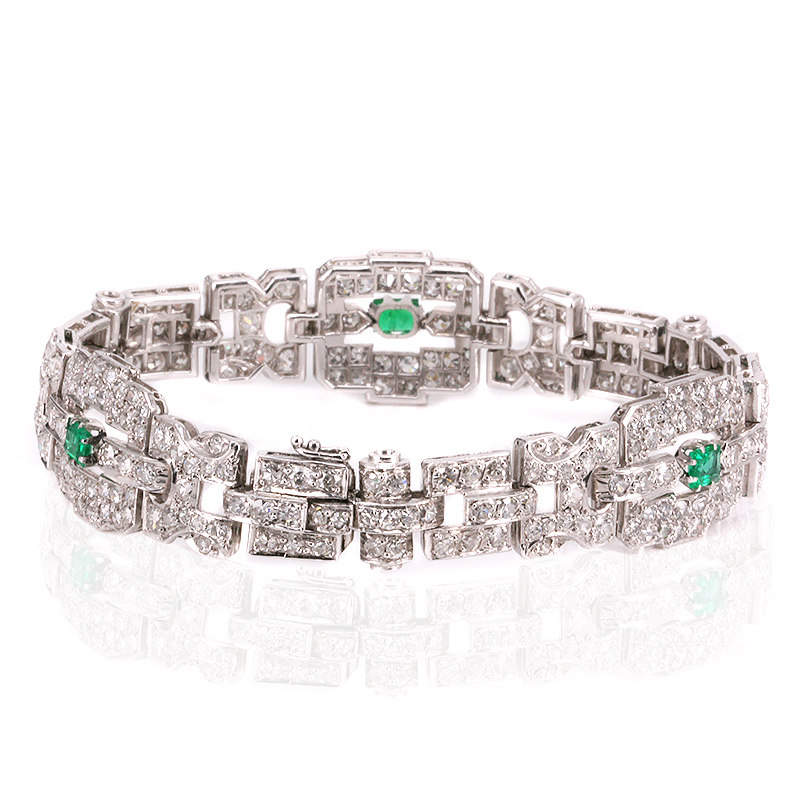 Tag: Art Deco emerald and diamond bracelet. 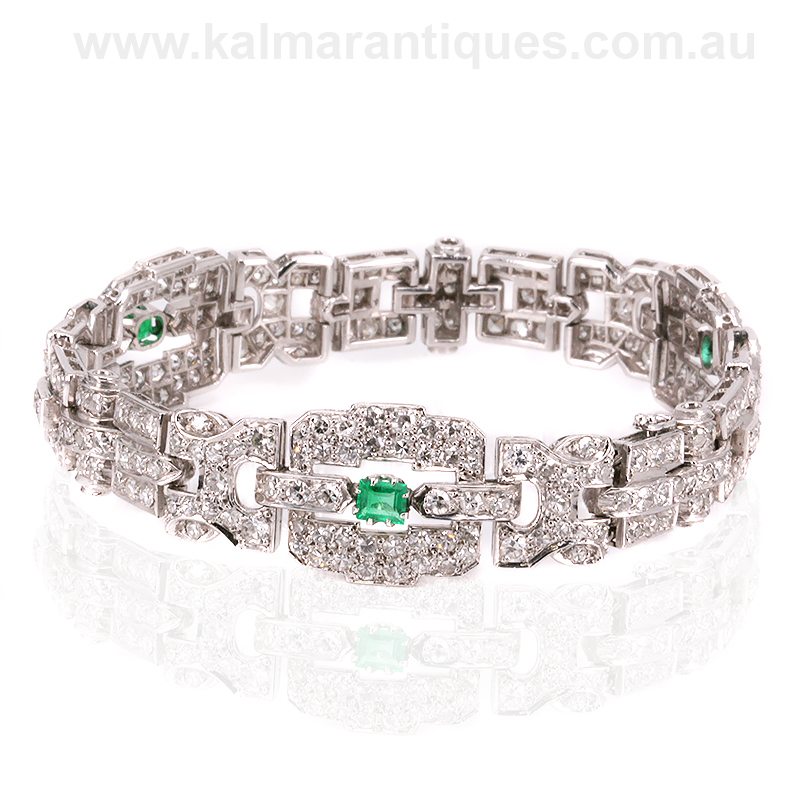 Made in the Art Deco period, this emerald and diamond bracelet was entirely hand made in platinum.